Is this the budget touchscreen laptop to get? Classy looks and a beefy processor, users won't be disappointed with this touchscreen Windows 8 laptop. Touchscreens are quickly becoming a standard feature on more 11-inch laptops. Blame or thank the Windows 8.1 tablet-ification of the Microsoft operating system but its a new development I'm starting to appreciate. 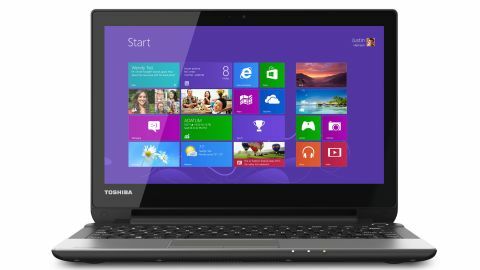 The latest touchscreen laptop to enter the fray is the Toshiba Satellite NB15t. With an 11.6-inch display, it's big enough to more easily balance on my lap than a 10-inch tablet whilst not moving up to sizable 13-inch notebooks. It's a nice middle ground that's perfect for school and small office work. Out of the 11-inch class touchscreen laptops I've handled before, the NB15t is between the smaller HP Pavilion TouchSmart 11 and the larger Acer C720P Chromebook. It's also powered by an Intel N2810 Celeron processor, whereas most of its competition have used AMD parts, except for the lower spec Celeron processor on the Chromebook. The NB15t feels incredibly compact despite being on the larger side of the 11-inch scale. The design of the NB15t is sharp and tight. There's practically no flex or hollow spots on the laptop's entire 11.2 x 8.2 x 0.99-inch (about 28.4 x 20.8 x 2.5-centimeter) silver plastic body. This is particularly true for the Toshiba's main half, which seems to have been stripped down to make it as thin as possible to a half-inch thickness (about 12.7-millimeters). Unfortunately, even with all the nipping and tucking, the laptop still weighs in at a hefty 3.3 pounds (about 1.4 kilograms). One notable NB15t design quirk is that its lid and palm rests are covered with a faux aluminum shell featuring a thinly lined texture. It's a nice touch that makes the laptop feel classier than a regular old glossy or matte finished plastic, and it's not too shabby at keeping greasy fingerprints away either. Along the left side there's a VGA output, Ethernet, USB 3.0 port and HDMI out; then a useful microSD card reader, headphone and microphone jack, two USB 2.0 ports, plus the power adapter on the right. With a relatively fresh Bay Trail processor onboard, I hope to see some good performance balanced with fair battery life. Now it's just a matter of finding out if there's more to this touchscreen laptop than meets the eye. As we previously mentioned, the Toshiba really stretches the waistband of the 11-inch form factor at 11.2 x 8.2 x 0.99-inches (W x D x H) and 3.3 pounds. Still, compared to the 8.53 x 11.41 x 0.87-inches HP Pavilion TouchSmart 11, the NB15t is just slightly slimmer in nearly every aspect including the HP's 3.4 weight. Users wanting something a bit smaller should look at the lighter and thinner 11.34 x 8.03 x 0.78 inch Acer C720P Chromebook weighing in at 2.97 pounds. Of course the heavy Satellite is nowhere near as compact as the 11-inch Macbook Air's 11.8 x 0.11 x 0.68-inch aluminum body. Doesn't look all that 'budget', does it? The Toshiba NB15t hits all the usual marks for a budget laptop like a checklist, giving users everything they want in a generous package for $379 and AUS$549 (about £227). Still, you won't find anything zippy on the Toshiba like the Acer C720P's 16GB SSD, nor the Chromebook's smaller $300 and £249.99 (about AUS $334) pricetag. The better outfitted HP TouchSmart 11 beats the Toshiba with a 10-point multitouch screen compared to the NB15t lacking five-point multi-touch display. It also comes with a dedicated Radeon HD 8210 graphics card, which adds just a few extra bucks raising the HP TouchSmart 11's price to $384 (£330 and AUS $549).